I thought I might write something a bit more personal, to give you some insight into what drives Digital Spice to develop great looking websites to help small to medium businesses grow online. Digital Spice started up around mid 2012, though we had been building websites for many years before this. We’ve had a few name changes! Originally we had our own separate businesses, I was trading under GemStar Design which became GemStar Interactive and Simon traded under Studio Lucid. We combined forces and became Chilli Web Design which then became Digital Spice a couple years later. 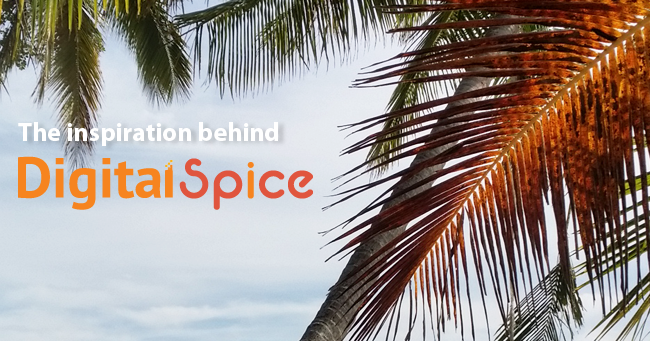 Why Digital Spice? – a recipe of it’s own – a bit of creativity, a touch of spice and a hint of passion. We are passionate about our work (and also a love for good food) so it seemed a fitting name. We are stationed in beautiful Far North QLD. Our HQ is right in the heart of the Daintree, only 30 minutes from Cape Tribulation, 1 hour from Port Douglas, 2 hours down the road to Cairns. We provide professional website design services to clients all around Australia. We even have clients in Western Australia – one even based in Ireland! So no matter where you’re located we can make you look great on the web. As web designers, we absorb creativity from our surrounds. So having such a stunning natural environment of ancient Daintree rainforest, gorgeous white sandy beaches (all along the FNQ coast) and the incredible Great Barrier Reef just offshore, our new base provides an amazing environment for new inspiration. Digital Spice is a small business – consisting of my partner Simon Hodgson and myself Gemma Heggie. More about us here. We provide customer focused solutions – and you get to deal with the business owners, so you know you’re getting personalised and dedicated service. You can view a portfolio of our website design and development work here. We enjoy getting to know about our clients, their businesses and goals. We’ve helped many start-up businesses and provided guidance and support to all our clients to help their business grow online. We’ve received some great testimonials along the way! If you’re looking for a web designer to provide professional advice and results – look no further. Whether you’re a business, accommodation provider, tourism operator, tradie, organisation or individual – we look forward to working with you. Give Digital Spice a call on (07) 4219 5000 to discuss your website needs, or request a quote online.